The scale of the fraud was so immense that Columbia/HCA Healthcare ended up paying more than $2 billion (PDF) back to the federal government in the single largest fraud case in history. (The previous record holder? Drexel Burnham.) Scott resigned shortly before the judgment came down. Today, Scott is enjoying a second act as governor of Florida. And, as Suzy Khimm reports, he doesn’t seem all that chastened. Before running for office, he turned his $62 million stake in Solantic, the urgent-care clinic chain he founded after resigning from Columbia/HCA Healthcare, over to a trust in his wife’s name. Solantic doesn’t take traditional Medicaid, but it does work with the private HMOs that, under a 2005 pilot program, were allowed to contract with Medicaid. And Scott is now pushing a bill that would expand that program across the state making those HMOs – the ones Solantic works with – the norm for Medicaid.
. Which is, for Scott, real progress. In the 1990s, he made his money off single-payer health-care programs by cheating them. Today, he’s making his money off single-payer health-care programs by running them. No matter how you look at it, it’s a step up. Alt dette via Ezra Klein. Introduksjon til helseøkonomi i USA. President Obama fikk først godkjent helsereform, nå har kongressen tatt bort pengene (blir nok begravd i senatet), så spørsmålet er egentlig: hvordan fungerer egentlig helsesystemet i USA. Her i Norge har vi ‘universal healthcare’, men i USA har de bare vært nære èn gang, Harry Truman etter andre verdenskrig (FDR var inne på noe av det samme før krigen). Det skjedde ikke. The first question is: what are the concepts? I can think of some off the top of my head (listed below). But I’ll bet you can think of many I’ve overlooked. As you request them, I’ll add them to the list below. When I have time I’ll put out a ‘Simply put’ post. I’d like to say I’ll do one per week, but I shouldn’t make an explicit commitment. The following will also serve as an index. I’ll come back here and hyperlink the list items to posts. Please put your suggestions in the comments and I’ll add them to the list. Anything is fair game, so long as it is a basic concept. Think of the key words that get tossed around. What must an individual know in order to fully understand the health policy debate? Når betaling for resultater IKKE VIRKER i helsevesenet, U.K. utgave. We studied a large scale pay for performance policy in the four countries of the United Kingdom (England, Scotland, Wales, and Northern Ireland), which targeted several chronic diseases in primary care, and evaluated its impact on the management and outcomes of hypertension. Based on the proportion of patients achieving certain quality indicators, general practitioners could receive payments as high as 25% of their total income. 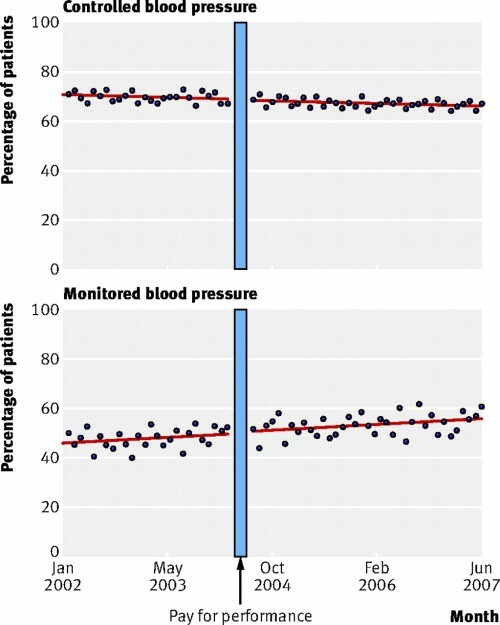 The programme started in April 2004 and included 136 quality indicators, including five for hypertension (see web extra), one of which was the proportion of patients with blood pressures controlled to 150/90 mm Hg or less. This natural experiment was ideal for detecting the effects of pay for performance on the care and outcomes of hypertension. Although the programme was voluntary, 99.6% of general practitioners participated. The financial incentives for doctors to achieve the quality standards were substantial; the UK National Health Service committed £1.8bn (€2.1bn; $2.8bn) in funding. Almost simultaneously (June 2004) the National Institute for Health and Clinical excellence (NICE) released guidelines for the detection and management of hypertension, which were consistent with the pay for performance intervention guidance and may have also reinforced the intervention. 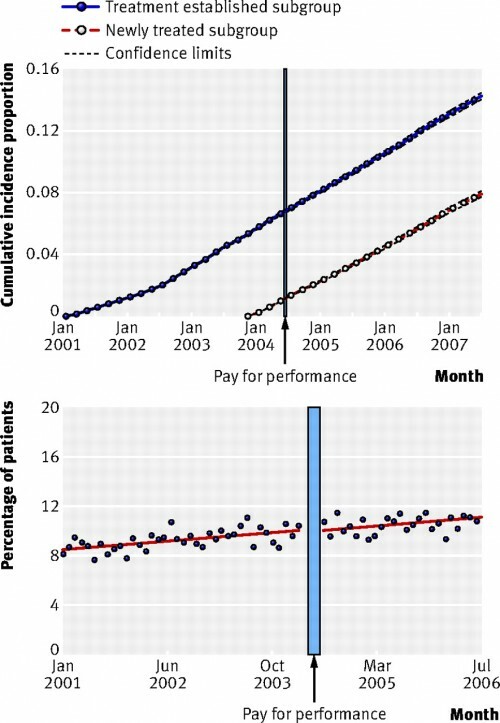 Using data obtained from representative primary care practices in the United Kingdom, we evaluated whether the introduction of pay for performance had an impact on quality of care for hypertension and the risk of major adverse clinical outcomes. The top chart shows the percentage of patients whose blood pressure was controlled. As you can see, things were improving slightly before the pay for performance kicked in. After it did, there was no change in the trend. The economic incentive program had no effect. The bottom chart shows the percentage of patients who were having their high blood pressure monitored. No change there because of the program either. I concede that these are process measures. But process measures are often how pay for performance is operationalized. We measure whether labs are drawn or visits happen, not how sick patients get. But let’s say we did. Was there a difference in outcomes? No. The top chart here is the cumulative percentage patients in the study who had a heart attack, heart failure, stroke, or renal failure. There was no difference in the cumulative rate before or after pay for performance kicked in. The bottom chart is the percentage of patients who died. No effect there either. Pay for performance didn’t work. Now I know many of you are going to argue that the UK is not the US. I concede the point. But there’s no reason to believe that the docs there wouldn’t be interested in economic incentives. And the incentives are large here. Physicians could receive bonuses up to 25% of income? That’s an enormous amount of money. Heck, I think even I would be enticed by that amount. So why did this fail? Perhaps the doctors were already improving without the program. If that’s the case, though, then you don’t need economic incentives. It’s possible the incentives were too low. But I don’t think many will propose more than a 25% bonus. It’s also possible that the benchmarks which define success were too low and therefore didn’t improve outcomes. There’s no scientific reason to think that the recommendations weren’t appropriate, however. More likely, it’s what I’ve said before. Changing physician behavior is hard. It’s the reason I think tort reform won’t be a huge cost-saver either. But this is bad, because many people have hung their hat on pay for performance being the solution to health care quality and costs in the US. This study adds to the body of evidence that says that’s not the case. The same colleague who told me about the study suggested that we need to change the organizational structure of the practice, ie change the system, so quality doesn’t rely on one person or one process. I agree that’s much more likely to work. Others will say that’s the point of ACOs. But as we’ve discussed before, there are lotsofreasonstobelieve ACOs won’t lower costs (or improve quality). Moreover systems level changes would be harder, perhaps require investments up front, and not make for good sound bites. It might be better policy, but it doesn’t make for better politics. So for now, we’ll likely continue down this potential dead end. Glem politikken rundt helse for noen minutter, artikkelen forteller virkeligheten vi ofte glemmer. Health care from the heart – my response | The Incidental Economist: «Go back through nearly a year of posts, and I bet you won’t find many that talk about my experiences with patients. You might not even know I am a doctor. You’d never know that I am actually a pediatrician, and that I do still see patients now and then. I don’t talk about my clinical experience much with friends, or even family. Good morning, class. Today’s topic, as you know, is ‘The Evolution of the American Health-Care System’ between 2010 and 2030. Before we begin, either turn off your iGlasses or make sure they’re not set to holographically project whatever you’re daydreaming. I did not like last week’s glimpse into Alexa’s subconscious. As you’re aware, 2010 was a turning point for the American health-care system: The Patient Protection and Affordable Care Act was signed into law. It was a clunky piece of legislation – the product not merely of a year of congressional negotiating and dealmaking but also of decades of defeats and diminished expectations for supporters of universal health care. After almost a century of failed attempts to extend coverage to every American, supporters gave up on perfection. Many of them even gave up on what they considered good. They just wanted to get it done. To do so, they embraced legislation similar to what Republicans had supported in 1993 and 2005. Of course, that didn’t mean Republicans liked it. After winning back the House in the 2010 midterm elections, they voted to repeal the law. As you might imagine, this effort didn’t get far in the Democrat-controlled Senate. Shortly after, the Supreme Court refused entreaties to excise the individual mandate – the requirement that every person have health insurance – from the legislation. The law was here to stay. In retrospect, for all the sound and fury it caused, the legislation was modest. It covered most, but not all, of the uninsured. It cut the deficit a bit. To give you an idea of its size and ambition – or lack thereof – when it was fully in place, the legislation accounted for about 4 percent of the country’s health-care spending. But like a lot of things in American politics during that period, it was blown out of proportion. As we know now, the law was the first word in health-care reform, not the last. The next big policy change came five years later, when the failure of a modest deficit-reduction bill caused the bond market to send interest rates on Treasury debt soaring. Congress got serious about deficit reduction, and fast. Three months later, the Balanced Budgets and Sustainable Growth Act of 2015 was signed into law. Among other things, it ended the deduction for employer-based health insurance and replaced it with a refundable tax credit for everyone, no matter where their coverage came from. To appreciate the irony of this, you have to know that this was the core of Republican John McCain’s health-care proposal in the 2008 presidential campaign. But Democrats objected to it because it would push people out of the employer-based market and into the individual market, which was a mess. President Obama’s health-care law, however, had replaced the individual market with exchanges in which insurers were tightly regulated – so, for instance, they couldn’t turn you away for a preexisting condition, or quietly cap your benefits, or sell you a plan that wasn’t really comprehensive – and consumers were pooled together, so they had bargaining power, rather than having to negotiate all on their own. In other words, it took ObamaCare to achieve McCainCare. As the employer-based market eroded, a central barrier fell between the health-care system we had and the health-care system we could afford. Now that individuals were seeing the entire cost of their coverage, rather than letting the company HR department do the paperwork for them, they found plans that controlled costs more effectively a whole lot more attractive. This, in turn, gave insurers more leverage against hospitals and, thus, gave hospitals more incentive to work with insurers to cut costs. It also created space in the country for a more sober discussion of health care. For many years, every serious conversation about cost control was derailed by the dreaded specter of ‘rationing.’ Of course, America was rationing the whole time – just doing it by income, so people who didn’t have much money didn’t get much health care. When there were hard choices to be made, the country tended to curl into a fetal position. In 2009, critics of the health-care overhaul assailed a provision to have Medicare pay for sessions in which seniors could talk with their doctors about various end-of-life options – including options wherein no expense would be spared to save their lives. End-of-life counseling was spun as establishing ‘death panels.’ When the Obama administration put some money toward research into which treatments work and which don’t, Congress attached language saying that Medicare and Medicaid couldn’t use the results to decide what they would and wouldn’t cover. Imagine that: They weren’t allowed to use evidence. But in 2019, at the urging of President Bobby Jindal, Congress passed the Health Care Equality Act, the third major phase of health-care reform. It fulfilled long-held conservative hopes when it moved Medicaid and Medicare onto the exchanges and allowed seniors and low-income Americans to choose between the government behemoths and private insurance. But it also opened both programs to all Americans – making them akin to the public option that Democrats had been unable to pass in 2010. And as part of the deal, both were given more freedom to use a flood of comparative data in deciding what treatments to cover or refuse, which allowed them to finally stop paying for volume and begin paying for quality. Nowadays, America’s health-care system isn’t perfect, but it works much better. And it’s no longer threatening to bankrupt the nation. It took several rounds of reform, each one building on the last. It was overdue, and it was slow and frustrating. But at least it got – Dammit, Alexa!